Donor Survey: You told us . . .
We recently sent out a survey to ask JustGive donors how we’re doing and get your opinion on some new potential giving services. A big thank you! to the 1,356 of you who took the time to complete the survey and give us feedback. The majority of you who responded were female (69%) and Baby Boomers (49%). Here’s what you shared with us. Over half of you make a donation at least every few months, and 32% actively give more than once a month. What prompts you to give is most often the fundraising effort of a friend or family member or an occasion (holiday, birthday, wedding, or memorial). You use a mix of sites for your giving, but predominantly give through JustGive or websites for specific charities. You’ve given in many different ways—most frequently by donating to causes you care about, for a fundraising campaign, or as a gift or memorial donation (total 73%). Generally speaking, Millennials were slightly less satisfied than Baby Boomers with our services. So we’ll continue to work on improving that through refreshed website pages and a better user experience. From your responses, we also learned we could do a better job talking about all the various giving services, like charity gift cards and recurring monthly donations. Donate to someone else’s fundraiser for a project or cause (54%). Create a fundraiser for your project or cause (27%). Donate by text message (18%). One of the biggest differences of opinion we saw about new services was that the ability to create a fundraiser was more desired by Millennials (born 1979 – 1994) than Baby Boomers (born 1946 – 1964). So you know: We’re working on the #1 service for you. Watch for more to come this fall on our improved fundraising product. Many of you took the time to add personal comments at the end of the survey. We received many keep up the good work, and quick, easy, convenient to use comments about the website. J. Hansen said, “Thanks for all you do to help so many!” We appreciate your confidence and praise for JustGive. Several of you mentioned our fees. Please know we’ll continue to operate as efficiently as possible to ensure that the most money from every dollar you give goes to your charity. Thank you all for giving us your feedback, which we’ll use to do our best so you can just give—anytime, anywhere, for anyone. To answer your frequently asked questions, we’re including them in our nonprofit blog. Bookmark the blog and you can use it as a place to check for answers. Each month, we’ll feature a question or two we get asked on a regular basis. When donors give on your site, you want it to be an easy and smooth process – with the donation page and receipt clearly showing them that their gift goes to your organization. So when you use the JustGive button, how’s that work? Here’s how. Can we customize the donation receipt? Yes you can, with your logo. When you customize your donation page and upload your logo, it will appear on every donor’s receipt. 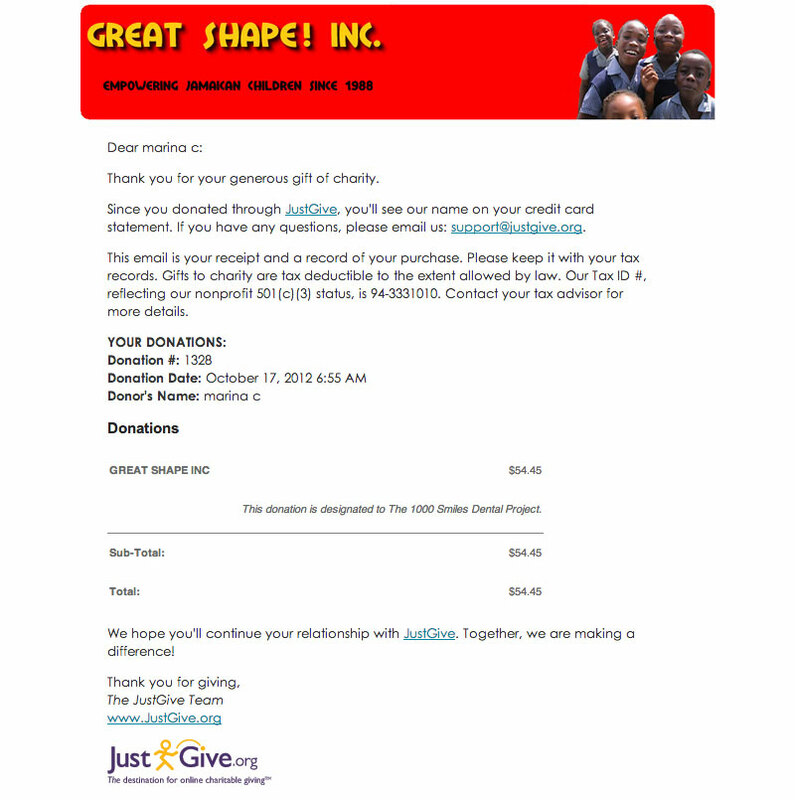 Adding your logo is the only change you can make to the donation receipt. This receipt, which also contains the required tax language, provides your donors with an email record of their gift. Taking a few minutes to customize your donation page is the best way to create a seamless donor experience. To find more nonprofit FAQs, visit our Help Center.